Doesn’t it look like you could walk here, like it isn’t 171,156,808 miles away (and growing more distant every second according to a real-time distance calculator)? Reading the news online, having not nearly as much interest as I wanted, I heard they sent another mobile probe to Mars. It was good to hear the word NASA again for some reason. Yet it was the pictures sent back from the red planet that genuinely caught me. This was right before the olympics, I think, and hearing a joke that it took what…16 minutes for images to get here from Mars – but video from London taking 6 hours. 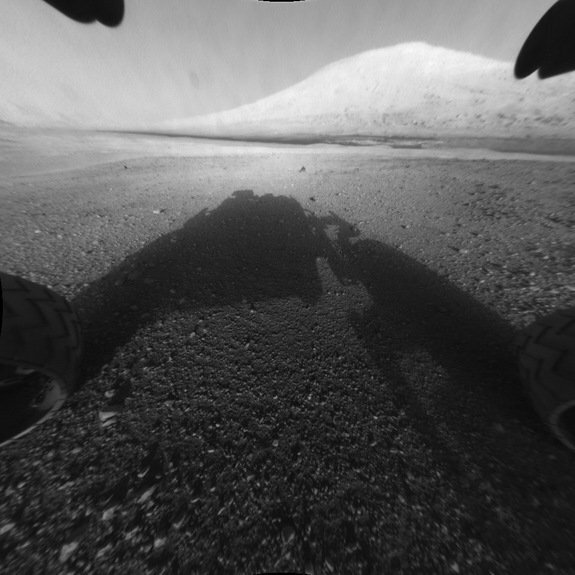 There was one image in particular, not blurry, not pixellated, not of a landscape stuck in a crater, but a crystal clear horizon with a mountain, and a familiarizing shadow of the rover to compliment the privilege of seeing another planet. I stared at the image for a while, taking myself there – no, bringing it to me. I imagined walking there, like I was hiking a barren desert (I really like hiking in deserts – that is when I can get to one). Images are from NASA – there are lots more. 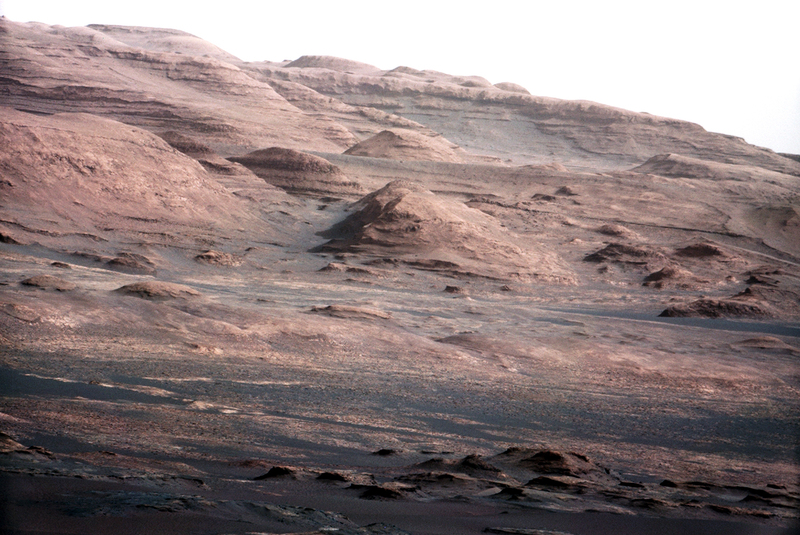 Then came the color, more images sent home of landscapes and views from Curiosity’s camera, whether including parts of itself in the view or not. This also helped shape how I wanted to build my drink. It can’t be a bright red drink. Mars is not bright red, or not as red as some of the from-space images I’ve seen. Yet again I stared. It was so easy to take in, and before I knew it, I forgot how difficult it was to bring this image to my eyes. How many millions of dollars? How much time planning it, building it, and finally sending it? How many people invested? How hard was it to send this incredible machine to another planet? How hard was it to make this incredible machine send this image to Earth? Here’s to the Mars Rover Curiosity, or to all who had a hand in her triumphs. Muddle lime & brown sugar. Add rest of ingredients, shake with equal amount of crushed ice (around 3/4 cup). Pour unstrained into chilled double old fashioned glass, or big enough cocktail glass. With a fine grater, dust lightly with nutmeg. Garnish with a wedge of ruby red grapefruit with 2 cherries skewered, and a sprig of mint, to look like the rover (kind of) coming over the rim of the glass, just as unstoppable as your thirst. I also added a slice of carambola, AKA star fruit – I thought appropriate. Since this is summer, there aren’t any blood oranges around. They are almost always limited to the season, whereas regular oranges are more prolific and abundant. For those who have not heard of the blood orange, please don’t panic – it is citrus only, just like any other citrus. 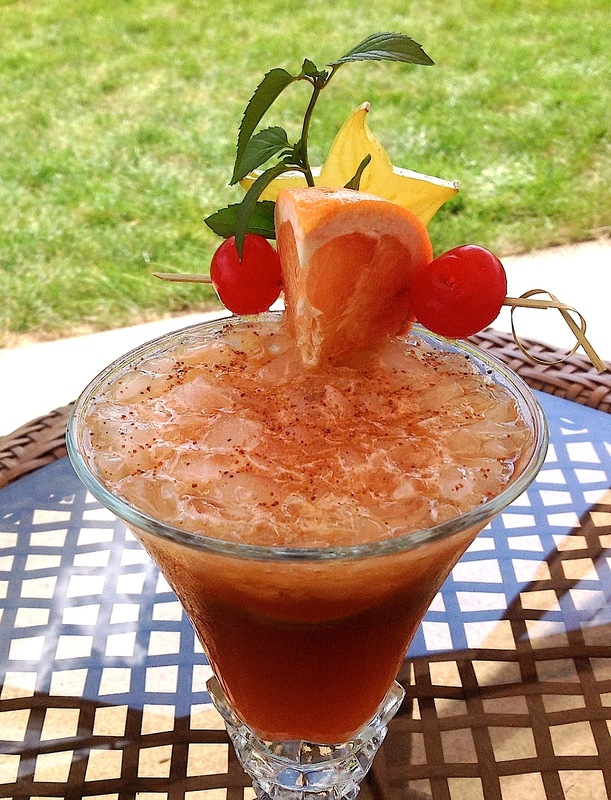 If you don’t believe me, check out some of the True Blood cocktail recipes. Or, if you prefer it out of the bottle, HBO describes their True Blood version as “…a delicious blood orange carbonated drink inspired by Bill’s favorite synthetic blood nourishment beverage.” I found blood orange juice in the supermarket, hopefully just as easy to find for you too. If you don’t have nutmeg seeds, or cannot find any easily, it might lightly roast ground nutmeg in a fry pan to wake up the flavor and aroma (I’m just talking about for 20-30 seconds – you’ll smell when it’s done). If you don’t have Rhum Barbancourt, another agricole will work. Light Bacardi could replace it, even though it does not resemble the flavor. Also, Lemon Hart can be replaced with another demerara; but since it is overproof – add twice the amount of your 80 proof to equal the attempted flavor. I would however highly recommend getting a bottle of Mount Gay, not merely because it is one of my favorite rums, but is easily available, and flexible in a great many drinks. Some might consider this a sour drink, or at least very tangy. As with all drinks, if you prefer more sweetness, make it the way you want it. I’ve tried to balance the sweet and sour, but understand not everybody likes sharp contrasts of citrus over the other fruit flavors. Since I ask for brown sugar, it might be better to up the sweetness with simple syrup instead so not to overpower with molassesness. I like molasses flavor, but thought only a little was important when mixing with the other enhancements. Regardless, this is a sipping drink, thanks in part by the tool of crushed ice to slow you down (I respect it as a tool, instead of straining it). When I sip on a drink, I reflect. And reflecting is the point of this drink, reflecting on the reason I made it, of a far away place brought closer. Sobriety is the disease, we're the cure.